The sounds a theremin makes are all very ghost-like, so I thought it would be fitting for a ghost to play its own soundtrack of 'life'. This automaton was designed in collaboration with Eyal Shahar. 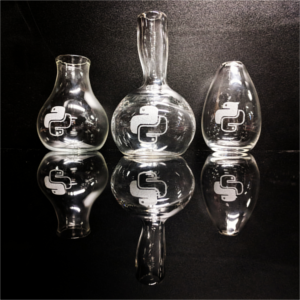 I've used Python Flask a few times for my hacks, so I made a Python flask. This and a couple of Python vases were donated to the PyLadies charity auction in May 2018. 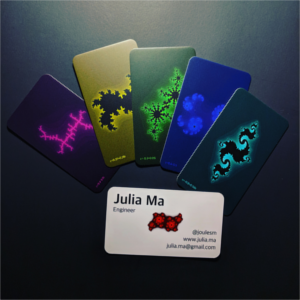 I designed personal business cards with various Julia fractals and their parameters. One of my best friends had a baby and I wanted to make her something that incorporated elements from our friend group. I asked each friend and their partner to give me a shape that symbolizes them. 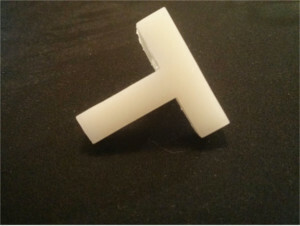 I designed and lasercut the pieces, including the support beams. My symbol is the wavelength-spaced color bands. 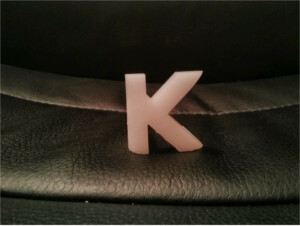 More images and videos. 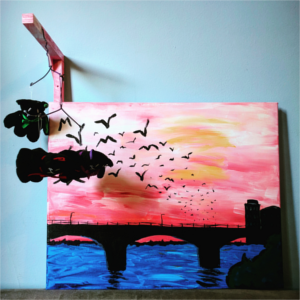 I randomly have 3 stuffed bats and was invited to a paint night in Austin. I wanted my painting to be more dynamic and I love puns, so I altered the painting's perspective to let the bats fly out of the canvas. 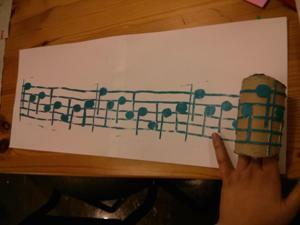 I am intrigued by the idea of an endless-stamp and have been wanting to make a musical notation stamp kit. 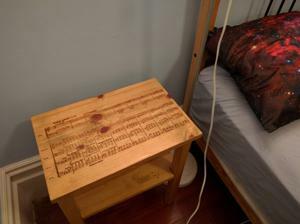 Since Pachelbel's Canon is a well-known song where the bass line (oh the poor cellists) repeats ad finitum, I decided to make it into a roller print. Labyrinth is one of Eyal's favorite movies, and he especially loves the masquerade ball scene where Sarah is surrounded by these crazy beautiful masks. We have also been attending various steampunk events (Edwardian Ball, Dickens Fair) and keep seeing the same mask vendors. So when We Players (one of our favorite local theater groups) hosted a mask-making workshop, we immediately signed up and learned how to use plaster sheets. We also took a trip to Venice (motivated by my desire to visit Murano, the birthplace of Venetian glassblowing), talked to Venetian mask-makers, and took many pictures of inspirational masks. 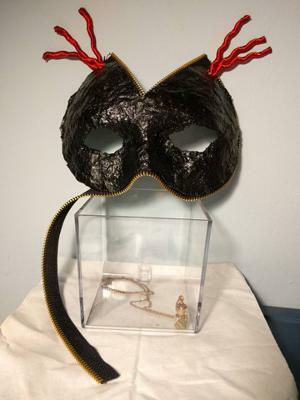 This is the mask I made for We Player's Capulet Ball. 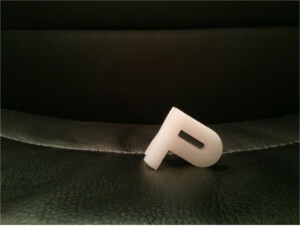 KJP and TPL letters, which are the initials of my friends, inspired by Godel, Escher, Bach. 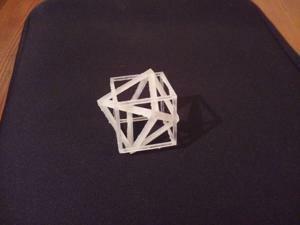 An octohedron trapped inside a cube, demonstrating the duality of these Platonic solids. One of my favorite chords is an E-flat dominant seventh played on top of an F-flat-major triad, featured in the "Augurs of Spring" from Stravinsky's "Rite of Spring" ballet. This is laser-etched into the top of a bedside table I built. You can here it in the first 10 seconds of this. 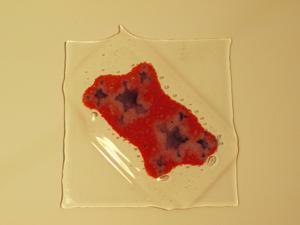 Eyal and I took a glass fusing class. 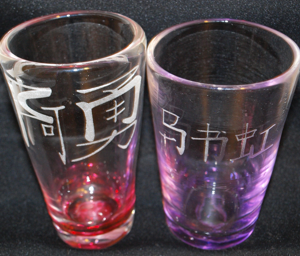 We laser-etched stencils for the various layers of the fractal and carefully shook glass powder on each layer. Then it goes, again carefully, into the annealer to be fused. 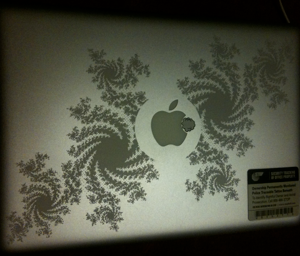 Laser-etched a Julia fractal onto my laptop. Fractal designed by me. 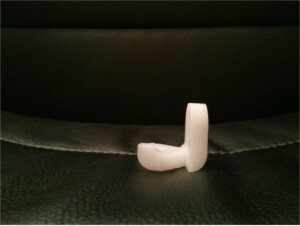 Laser operated by Eyal Shahar. 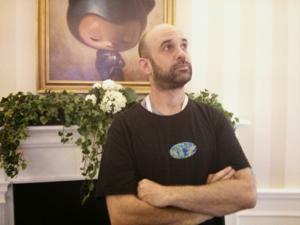 For SF Science Hack Day 2014, one of the lightning presenters said something like "hack the universe, you can do anything with the universe". Well, can we *wear* the universe?! 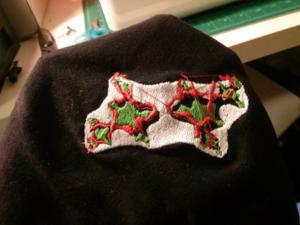 Eyal and I had recently been playing around with the embroidery function of our sewing machine, so we thought, why yes we can!! This is Zoey, who we catsit for a month. During that time, Zoey had a wound that had some complications, so she had to wear an e-collar. Turns out that the "e" in e-collar stands for "Elizabethan", which was amusing to me since an "Elizabethan collar" is already a thing!! 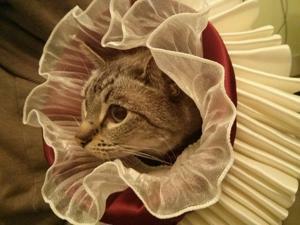 So I made Zoey an Elizabethan e-collar, or EE-collar. Similar to an ambigram, we combined the characters of Eyal's Chinese name with the Hebrew letters of my last name, and the characters of my Chinese name with the Hebrew letters of Eyal's last name. Glass blown by me. 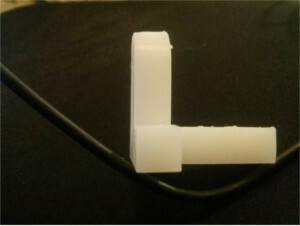 Laser operated by Eyal Shahar. A long time ago, I learned that cutting a Mobius strip down the center turns a 1-sided piece of paper into a 2-sided piece of paper. 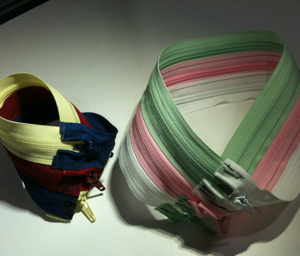 When I started playing with zippers, I wondered what kind of topological experiments I could do with them. 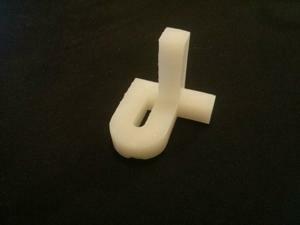 Unzipping a Mobius strip in half results in 1 loop with 2 twists. 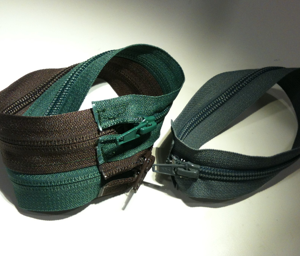 Unzipping a Mobius strip in thirds results in 2 loops: 1 Mobius strip entangled within a loop with 2 twists. 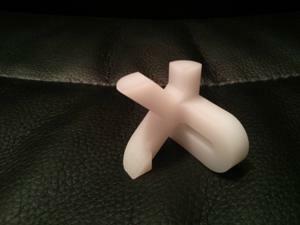 Unzipping a Mobius strip in fourths results in 2 loops entangled with each other, each with 2 twists. 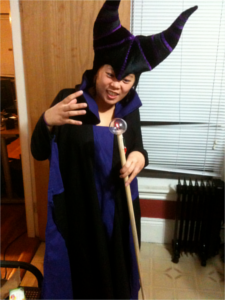 For Halloween 2011, I blew a glass bulb, inserted an LED, and created a glowing staff. I also sewed my dress. The headpiece was purchased. 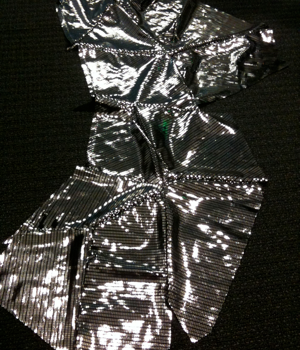 I am working on a patchwork skirt made of disco fabric. I really love the lines, angles, and light reflections from the pieces. 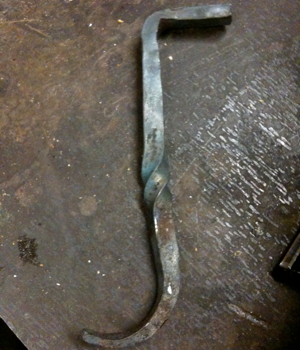 I took a blacksmithing class during MIT's Independent Activities Period and made these two hooks. 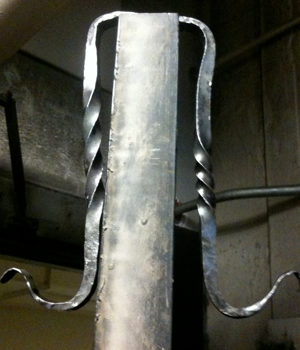 Heating, pounding, and twisting metal is fun!